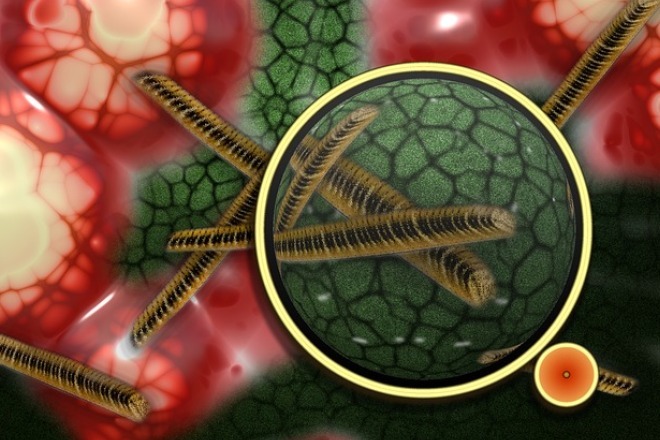 More and more, we hear and read about the importance of the microbiome, the ecological community of friendly and unfriendly microorganisms that share our body space. The human body contains as much as ten times more microbial organisms than human cells, and increasingly, changes to the microbiome are being associated with alterations, both good and bad, to our health. Most laypeople and physicians can be forgiven for wondering what could blood type possibly have to do with the microorganisms in the digestive system. Blood type, after all, is just an ornament on a red blood cell, right? A complication of transfusion. Sadly, not much else about blood type is taught as part of the standard medical curriculum. However readers of my books and followers of my diet theory already know that there is a much deeper and important role that blood type plays in conditioning our digestive tract; both in terms of the characteristics of the lining (mucosa) and the variations of the secretions (digestive juices) produced by the stomach and intestines. These blood type specific differences can themselves have an important effect in altering the microbial balance of the digestive tract. 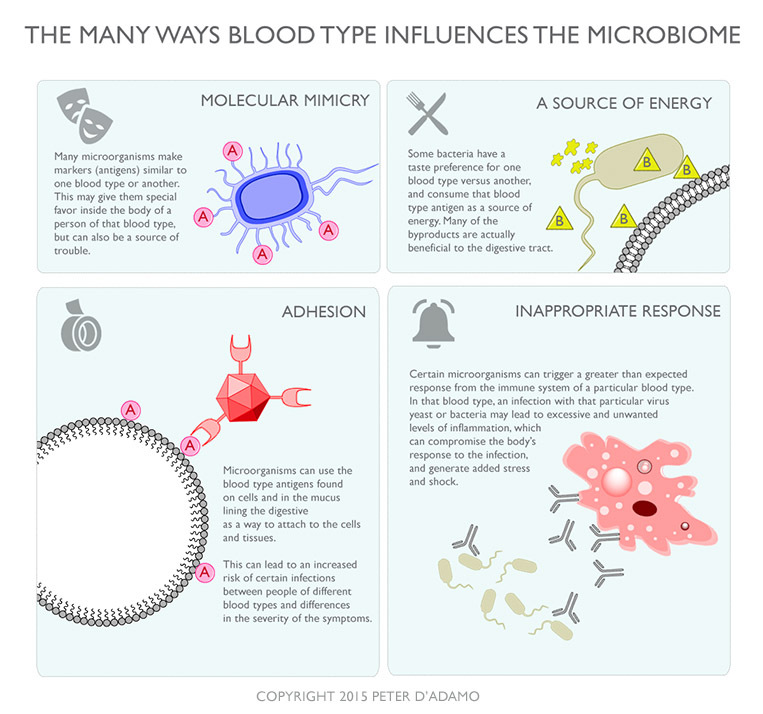 But there are even more elemental and direct ways that blood type can condition the microbiome. Although the average physician does not consider blood type antibodies beyond their role as a transfusion nuisance, common sense dictates that they serve a more basic role; natural selection obviously can not predict this type of need, despite its obviously life-saving benefits. Instead these antibodies work in combination with the antigens to create a molecular and immunologic 'line in the sand,' allowing microbial species with similarity to the antigen to avoid immune reaction, while targeting dissimilar strains for destruction. A large percentage of microogranisms share antigenic similarity with the ABO blood type antigens, which in themselves are nothing unique or special to humans. Thus, if you are a critter who has developed a similar antigen to the blood type antigen, you'll probably do fairly well in the gut of blood type A humans. On the other hand you are probably going to have real difficulties should you find yourself inside the body of a type B, as they carry antibodies (extremely powerful ones, by the way) to type A and will not like you very much at all. Many studies have associated increases in the blood type antibodies during many common infections, and the ability of type O to manufacture both anti-A and anti-B antibodies may have given them a real advantage when it came to natural resistance to many pathogenic bacteria and viruses. However similarity between your blood type antigen and the antigens on a microbe are no guarantee of future harmony. Just like an uninvited guest can sometimes get past the nightclub bouncer by claiming that 'I'm with the band,' microbes with ill-intent can evade the basic defenses by developing the ability to mimic the blood type antigen of their potential host/victim. Just as in Star Trek, this 'cloaking device' gives them a degree of invisibility from the immune system. In one study, microbial antigens crossreacting with blood group antigens were detected on cell walls of anaerobic bacteria from three of 10 cultures inoculated. (17) Other microbial felons may have an advantage due to their possessing specialized ways to attach to the blood type antigens in the gut, which makes infection much easier. Many of these 'molecular suction cups' are adhesive-type lectins, a class of proteins also found in many foods. A huge amount of research has been done correlating the differences in resistance to pathogenic microorganisms that exist between the different blood types. Historically, some of the most catastrophic epidemic and endemic diseases are ABO selective, and in many instances demonstrate ABO related differences in morbidity (sickness), mortality (death), or the level of the inflammatory response to the infection. Knowing your secretor type empowers you to further refine your Blood Type Diet and take strategic control of your own wellness and lifestyle choices.